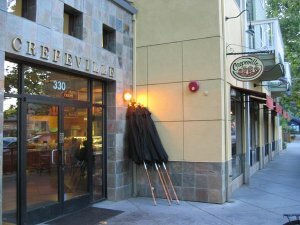 Crepeville (DavisWiki entry) is a restaurant located on 3rd Street in downtown Davis (near UC Davis). Crepeville provides wireless Internet access. Take 5th Street (aka Russell Blvd.) east. Turn right onto B Street. Turn left onto 3rd Street. Crepeville is on the right, at the corner of 3rd & C streets. Davis is about 1/2 hour west of downtown Sacramento. Take Highway 99 or Highway 5 north towards Sacramento. Take Highway 80 west towards San Fransico. Take the Richards Blvd Downtown exit. Richards goes under the train tracks just south of 1st street, where Richards becomes E Street. Turn left onto 1st Street. Turn right onto C Stret. Crepeville is on the left, at the corner of 3rd & C streets. Davis is about 15 minutes south of Woodland. Take Highway 113 south towards Davis. Take Highway 80 east towards Sacramento. ... follow the instructions below. Take Road 102 south towards Davis. Road 102 becomes Pole Line Road. Turn right into 5th street and head towards downtown and UC Davis. Turn left onto B Street. Davis is about 1 to 2 hours east of the Bay Area. Take Highway 37 east towards Vacaville. Take the Richards Blvd. exit. Turn right onto Richards, to head downtown. (Note: stay in the left lane, or you will be forced to exit back onto 80). Unitrans A-Line Schedule A-Line stops at 1st & C and 2nd & B (eastbound). Unitrans L-Line Schedule L-Line stops at A Street Hutchison/Information kiosk. Unitrans W-Line Schedule W-Line stops at 1st & C and 1st & D.
Davis Community Transit can be scheduled to pick you up, and only costs $1.25! Many LUGOD members are willing to pick people up on their way to meetings. If you're in need of a ride, please contact LUGOD's Secretary, typescript@lugod.org, prior to the meeting! Provide the location you wish to be picked up from. We cannot guarantee a ride, and are not responsible for drivers. We simply do our best to provide this matching service.